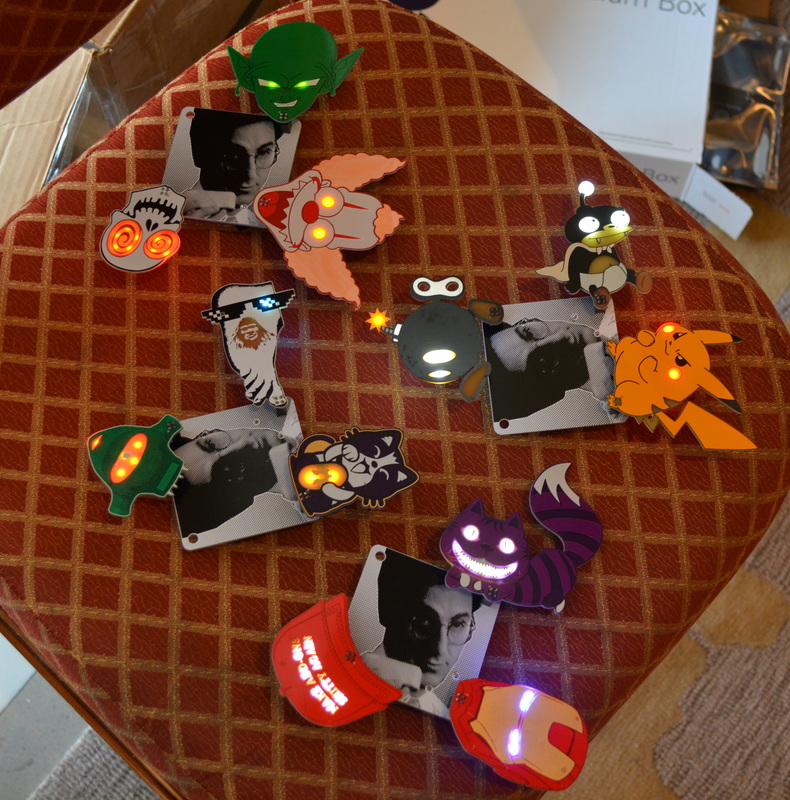 Two or three years back you would see a handful of really interesting unofficial badges at DEF CON. Now, there’s a deluge of clever, beautiful, and well executed badges. Last weekend I tried to see every badge and meet every badge maker. Normally, I would publish one megapost to show off everything I had seen, but this year I’m splitting it into volumes. Join me after the break for the first upload of the incredible badges of DC26! The Telephreak party at DEF CON is a gathering of a tight knit group of phone phreakers who spend the Sunday of DC having a good time. You can find them in advance of the party by looking for the Telephreak badge which is usually one of the more interesting offerings. This year’s badge is no exception. The screen on this badge is one of the best looking full-color screens I’ve seen on any badge. Photos are traded wirelessly between badges. One really interesting tidbit is that the badges are traded over a mesh network (badge to badge) and with each transfer, depending on the proximity and signal quality, the photos will degrade. Think of it like sending a fax of a fax of a fax. Very fitting for the phreakers! The badge itself is sporting an ATmega328 and a 915 MHz packet radio. 140 of these wer produced all by hand. I thought the auxiliary hardware @dominotree had with him was really interesting as well. He’s using a Teensy and a wireless module to “seed” new images. Read more about the badge on spun.io. If you wear it, does that make it a badge? No matter the answer, here’s an interesting one I bumped into at the hardware hacking village. It’s called the “Brotherhood of Steel” since it’s based on the Pip-Boy from Fallout. As you expect from the wrist-mount mult-tasker, this does a little bit of everything. It’ has those red bubble displays for displaying information, with four toggle switches and a d-pad. With the case off you can see the laser diode, Adafruit GPS, and Honeywell compass. It’s running on an NXP ARM controller fed by 400 mAh LiPo that’s nestled between the PCB and the lower portion of the case. 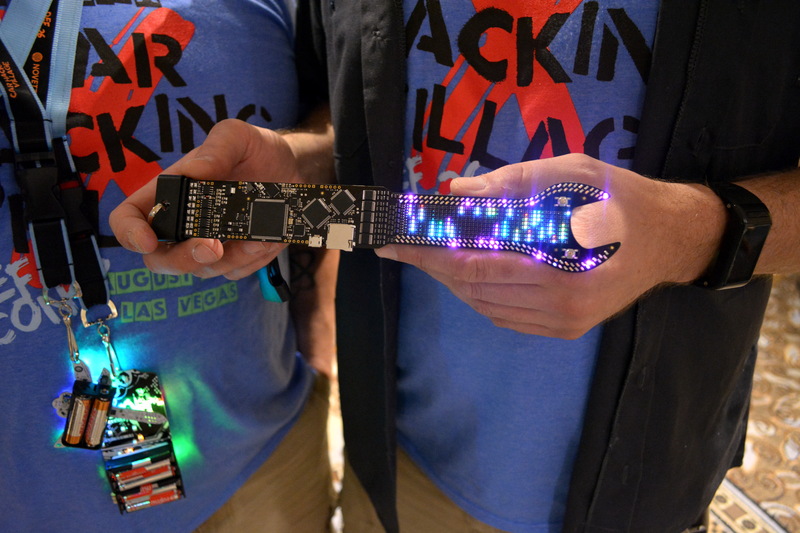 The Car Hacking Village badge gets a shout-out for the most TSA unfriendly. 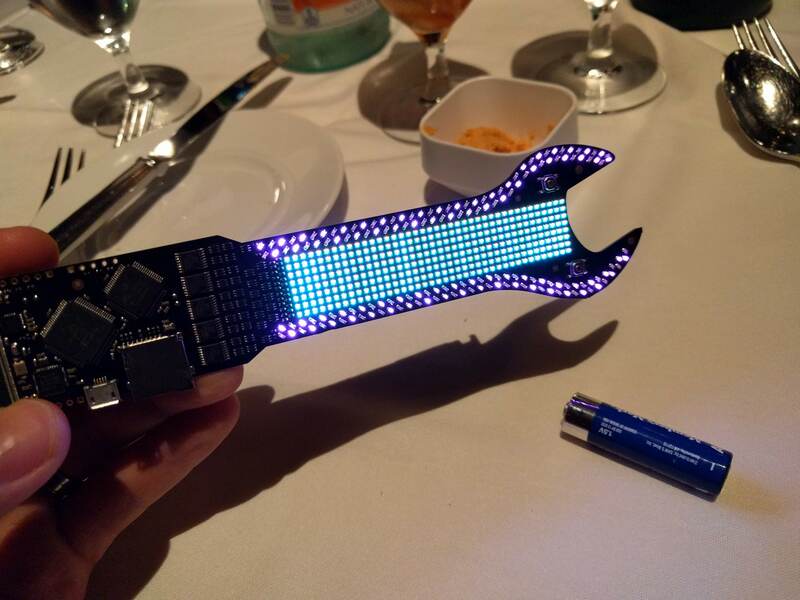 I checked my in my luggage after reading some Tweets that this badge looks like a wrench that is beyond the allowable size by airport security. At least one of these was pulled out and shown off in the airport! One end is an incredibly densely packed matrix of LEDs. The double-row that rings the outside of the board are purple. but the grind inside is RGB — 320 total 0404 parts laid out on a standard 4-layer board! What’s exceptionally interesting to me is that the scanning is being done with five 595 shift registers which you can see in a row just to the left of the LEDs. There are three microcontrollers on the board, all NXP; the s32, k22, and s99. In addition to blinking, you get ODB-II which lets you hack CAN bus using a scripting language, along with USB, and an SD card. This is the 4th year that they’ve done the car hacking village badge. There was some adversity this year as their original PCB supplier dropped the job and only told them three days before delivery. Looks like everything came out just fine though! This certainly was the year that badges got their own badges. The entrance of the 2×2 pin add-on standard meant there were a ton of people making simple yet interesting things to hang off of a pin socket. TwinkleTwinkie is hands-down the most prolific of add-on producers. You should definitely check out his Hackaday.io page, but above you can see some of my favorites like Big Green, Krusty the It, and Mad Cat. I also heard a story that Twinkle used to work in the printing industry which is why the half-tone art looks so great. Who could resist snapping a picture of a DeLorean add-on? This DeLorean add-on was designed by @reanimationxp, @tr_h, and @ssldemon. This also shows off the add-on totems that were used to show off add-ons without a badge. They simply provided ~3 V of power via a pair of batteries. The Linecon badge is a stunning example of half-tone art on a PCB. Despite the fairly low quality/resolution often face with PCB silk screen, this technique can deliver great looking boards. The board is driven by an STM32, using an IR sensor to count the number of times you dart your finger into the hole in the board. Yep, just about as fun as linecon — the art of standing in line waiting for the official DEF CON badge. There is also USB available for serial puzzles and unlocks. I really like the positioning of the three batteries on the back. Usually you just see a single 3-cell holder but this technique spreads the weight and bulk out. The OLED screen on board is your typical 64×128, and around the edges of the badge there are 30 APA102 RGB LEDs for bling. I would call this the “micro” badge, but I think Joe Fitz is actually pronouncing it the “you” badge. At any rate, the letter u indicates it is a small badge and I can confirm that this is trolling at its finest. 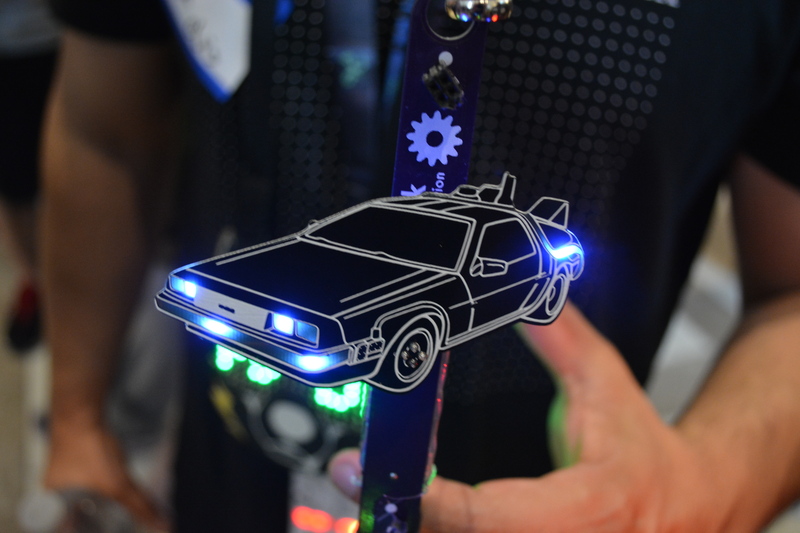 Joe’s badge is based on the Digispark, providing an ATtiny85 which you can plug into a USB cord and program yourself. The bulk of the “badge” is the add-on header itself. Speaking of the add-ons, Joe made up for the badge trolling with an impressive set of “arms” that extend the add-on header and allow more than one to be powered by the uBadge. Joe panelized these in a 10×10 grid, and populated 11 panels. That’s a lot of badges so make sure you ask him for one next time you see him. This is one of two badges I saw this year that includes motors. The Maneki Neko badge’s name includes the words for lucky cat in Japanese. It will hang from a lanyard, using the 12-segment displays to look at you and blink. When it’s time to wave, the eyes turn to asterisks and the left paw waves a few times. An STM32 controls the badge, driving the eyes and motor. There is a connector for an ESP8266 but that is up to the user to implement. We’re all badged out for the moment. Join us soon for Volume 2! Looks like Brian beat me to it… the Y and W are right next to each other on the keyboard… right? Makes me wonder if someone found my hand-wired addon that used the 4017 counter, clocking on SCL. It fell off at some point, and all I can hope was that it ended up being saved by someone else. Oh wow that DeLorean is gorgeous. Thanks! Creator here :) The windows were supposed to be copper, fab house messed up. We may do a second run if there is enough interest. How/where do I manifest my interest ?